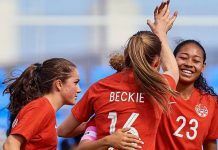 After winning two close games on Monday, Team Canada women have qualified for the playoffs at the 2015 Universiade in Granada, Spain, and remain undefeated with one day left in the round robin. 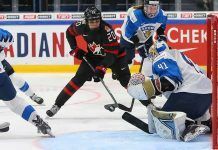 The morning game saw Canada’s Breanne Meakin and her Ottawa-based team of third Lauren Horton, second Lynn Kreviazuk, lead Jessica Armstrong and coach Doug Kreviazuk squeak by a strong Norwegian team. In the evening match-up, the Canadians battled the second-place Russians, skipped by Anna Sidorova, bronze medallist at the 2014 World Women’s Curling Championship in Saint John, N.B. The Norwegians, led by skip Pia Trulsen (4-4), gave Team Canada all they could handle. Trulsen opened the scoring with three, but Canada fought back quickly. Tied 4-4 at the break, the teams then went on a stealing spree, with Canada taking three straight singles before finally giving up a deuce. A stolen point in nine tied the game for Norway, but Meakin used hammer to get the single point in the extra end and keep Canada’s unbeaten streak alive. The game against Russia’s Sidorova was also a battle that started off slowly for the first few ends. But Canada surged ahead with five points in three ends – scoring a deuce in four and stealing the next two ends. The Russians made it close with a deuce in nine to trail by one heading into the final end, but Canada never relinquished the lead and held on for the 8-7 win. 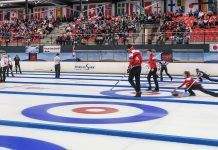 On the men’s side, Canada won its third in a row and handed Norway’s Steffen Walstad his first loss of the round robin on Monday afternoon. 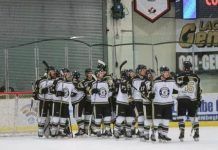 Matt Dunstone and his Winnipeg team of Daniel Grant, Jim Coleman, Chris Gallant and coach Scott Grant scored multiple points with hammer and held Walstad to singles until late in the game. A score of three by Canada in the eighth sealed the 9-7 victory. The men play Sweden’s Patric Mabergs at 3 a.m. EST and finish off the round robin against Japan’s Yasumasa Tanida (3-4) at 3 p.m. EST. The women will meet USA’s Emily Walker at 9 a.m. EST.